Most of the material I post on this blog is geared toward those who already have some knowledge of Arabic. However, I do realize that the majority of students are at a beginner level, so I'm going to start making more posts on the basics of Arabic. 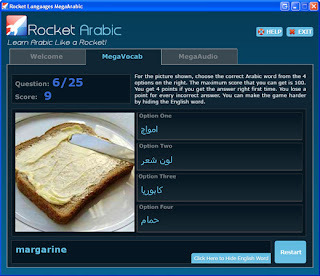 For those in the beginning stages of learning who want to become advanced, I recently had the chance to try a program from Rocket Languages for learning Arabic appropriately named, Rocket Arabic. It's basically a combination of Pimsleur and Rosetta Stone, but for a lot less money. It teaches Egyptian Arabic since that is the most widespread dialect and all Arabs understand it to varying degrees. Their site has lengthy audio samples from their course, one from the beginning part of the course and one from the more advanced section. Unlike Pimsleur they include the Arabic transcripts and English translations. Anyone who has read my posts knows how much I love transcripts! They really help for those times when you just can't seem to hear what word is being said and when you would otherwise be lost. There is also a 6 day free course you can download to see if you think you'll benefit from the full version.The course comes with a computer program as well, which is comparable to Rosetta Stone in that it shows you pictures and you have to choose the correct response. Unlike simply memorizing vocab lists, this type of learning puts the meanings of the words into your mind on a deeper level. You aren't simply correlating a word in English with a word in Arabic, but you're learning like you learned your native language, by seeing what the words mean and connecting them to their meaning instead of to an English word. This improves recall and means that you'll remember the words for the long term, more so than if you had learned them by simply memorizing vocab lists. I suggest that you go with the digital download version when purchasing Rocket Arabic because it's a full $250 cheaper. For some reason they charge $50 for shipping and handling. Some people like to have a physical copy of things though, so to each his own. The program also has a 60 day money back guarantee so if you find that it's not for you or you change your mind there's no harm, no foul. www.80percentwords.com was a waste of time. The site showed 4 words and expects you to pick the right one but with out teaching the word first. Maybe there is more to it then this but I could not figure it out, Not user friendly either. This blog is great! And I tried Rocket Arabic based on your suggestion. And I found another online, interactive, Arabic program that is similar to Rocket Arabic, that that includes MSA, Egyptian dialect and Moroccan dialect. I am trying to learn levantine arabic because my family is syrian. I have a limited amount of time to do this because my grandfather is old. I am currently doing pimsleur but would like to do more. I am hesitant to do rocket because im not sure if doing it will be a waste of time, as my only goal right now is to speak to and like them. What would you suggest?